The temperature outside is around 2 degrees on this blustery January morning, although the sun is out the wind chill is about 10 degrees below. I guess there will be no outside gardening today, so this is a good day to read and to write. Finding the sunniest spot in the house which is the sofa in the parlor was my first mission. With a 8 foot palm tree over my head I imagine myself on some private island in the Caribbean where the flowers are in full bloom, the temps in the 70’s and a soft sea breeze rustles through the palms. But as I am not in that location, reality sets in and as I look about me, I see that I have created a sort of oases of my own. I have orchid plants and ferns in the bay window and a 8 foot palm here behind the sofa. That alone gave me a feeling of warmth. About 12 years ago I purchased this palm – Phoenix roebelenii ( Dwarf Date Palm ) at about a 3 foot height at Home Depot, because I was using it for a one season plant as a center plant in one of the pool side displays, thinking it would give a great island feel, plus the price was right for that purpose. The palm did well and looked so good all that summer that the thought, letting it freeze wasn’t to happen, then it became one of those plants that did so well that even the thought of letting it go was out of the question. Well needless to say 12 years later the palm is 8 foot tall and our ceiling are the same. I read that the maximum height of these palms are 10 feet. So either we make it fit or we cut a hole in the ceiling, and that is something I would think about, but my wife Jan probably would frown upon. Taking plants in to the home or greenhouse is something we must do in the northern hemisphere if we are to keep our gardening sanity, just to have some growing green and flowers around us helps to occupy our thoughts and gives us something to care for. Just remember don’t over water and feed moderately and give as much light as you can to them and most plants will come through the winter months well. It was the Victorian that first brought the palms to the parlor because of their beauty and grace and ease of care with low light tolerance. I must say that the 12 years our palm has been with us, other than feeding and one repotting because of their small root system it has been one of the easiest plants I have ever had. Not to mention the warm memories it brings to the cottage. So I’m thinking tonight some candles, colorful fruit drinks with little umbrellas, Island music and thoughts of where I should be, right here on my own tropical island in Acorn Cottage. A thought; If its not the right palm, it may not be for the parlor. I am writing this while traveling to our daughter’s home in the Carolina’s. I can’t help but think of her as a little girl with wide blue eyes, clapping her hands each time the Christmas tree was lit and the wonderous looks she gave to each of the many ornaments, and my heart grows heavy with those many memories. Our granddaughter Savannah I was told turns their tree on and claps her hands with excitement and I can’t wait to get there. There will be hugs and kisses all around and a wonderful dinner, I am sure, as Jan will take on being mom/gramma and tend to the kitchen with her loving ways. It is a Holiday Wish that all of us could be together at Alexsandra’s as she is the youngest and this will be their first Christmas at her home with us. Jan’s Mom and Dad are on their way and it will be a joy to see them. Abigail and her family will be missed, but in our hearts this year and always, as her husbands duties keep them at their home in Oklahoma this year. My Holiday Wish, is for a garden filled with family and friends, for health and happiness and the wisdom to remember what is truly important, that where ever you are and what ever you do, live in the moment, it is the only real garden to tend with love. Wishing you, Happy Holidays with Love ! A thought; Love is one of the best ingredient for everything, use it freely, it is not limited. I felt I needed to share with you something that came to me to other day while working in the Shire Garden. As you know well I spend a lot of time in the garden, and while there I use this quiet to think about many things and to work through problems. However this day just the thought of working in the garden was just, well, joy. Its beauty was still in full view even as the winter cold approaches. things have grown nicely over time. Your tender yet sometimes ruff touch has kept things growing. and a beautiful one I must say. Due to your time spent with me each day. and my rewards are the flowers and fruit I can provide. The birds and butterflies and bee’s are my friends, thank you for letting them in. When the rain dances over me you rejoice and with the sun’s warmth you tend to my every need. as we create a heaven on earth. to you a place where all your dreams can come true. As I write this and I recall clearly the words spoken to me. I can’t help but feel humbled by the simple joy that gardening can bring. As to whether the garden really spoke to me, well the words came from somewhere and who am I not to believe! A thought; At this time of the year our belief system is put to a test, pass it wisely……..
My very first garden was a herb garden, and my love for them has only grown stronger. I have spent a lot of time over the years in herb gardens and can tell you they are an easy lot of plants to grow. Just spade up some semi-sandy or partly gravel area in the sun, add some dried cow manure and your herbs will do fairly well. To rich a soil and too much water is a bad combination for them, heavy fast growth causes a short span for the fragrant oils you want from within the herbs. There are annual and perennial herbs and most are easy to start from seed and most nurseries now carry a large variety of herbs of all types. Although most herb gardens are informal or are placed among the vegetables in the garden, I have had the pleasure to have been asked to plan and plant a formal herb garden to be enjoyed by not only the cook and doctor, but also for the visitor who will enjoy the heightening of all of their senses. The beauty of this garden is in its shades of gray and green foliage and the simplest of blooms. The formal comes with clear sight lines and focal interest and low herb bed hedges, with a knot garden of Santolina, sage, rosemary and lavender, in the center to create great drama. 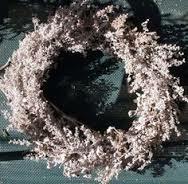 Here in the Shire Garden the herbs are grown for cooking and holiday decorating, We make Artemisia wreaths with touches of thyme, rosemary and lavender tucked into them. The many bunches of small bouquets of both cooking and fragrant herbs are readied for gifting, while others are dried and ground up to be used in our every day and holiday cooking. Herbs are used for healing, savoring and enhancing, but by no means should we overlook their beauty for purpose. For to look at their beauty in a garden gives you the awareness of the simplicity in beauty. Herbs are mentioned thru out history and their uses in ceremony and legend are well touted. Try planting them in pots for by the kitchen door where garden space might be limited or among your flowers for color enhancement. But whatever you do bring more of them into your life. For me the herb’s are royal and their purpose is noble, but above all of that, they are spiritual and their presence in the garden is a testament to that. A thought; Delightful and sometimes pungent, sweet and heady odors that take our thoughts thru the past, in that remarkable way that only herbs can do. Sometimes simple things can bring on much to feel and or to think about. It maybe just a single word or symbol. It makes us stop and to poise for a moment, and you know something from deep within has been found and touched, perhaps a memory of someone or thing, your favorite pet or place, but somehow, in these few words found in the garden you find a wisdom the moves from within. Over the years I have visited many gardens and am always moved by small signs that may be small frames of wood or painted on mirrors and old doors and watering cans, on old tools and gates, even stones are used to convey a message to invoke thought. With the sun in my heart I will grow like the garden. Feel free to talk to the plants they understand. Everything that might set us back into the slower pace in life, is a good thing, and gardening is an instrument of grace. A beautiful garden is a work of the heart. I live in the garden, I just sleep in the house. The garden is a mirror of the heart. The bees are the song that I hum. Butterflies teach us to float in our flight. The gate to my desires. Daisy’s help keep it simple. Most times we are so busy passing through that we forget to stop for a moment to see where we are and to enjoy the world around us , so we try with a few words to get our minds off of what we are doing and to reboot our thought direction to a more meaningful, simple way. Simply put, the next time you read the sign that you stand before, read it, take time to feel it and try to understand its wisdom invoked to you. Because from simple things come answers to who, why and what we are in a moment of wisdom. A thought; Wisdom when understood helps us to grow…..
From the start of this blog I have hesitated writing about roses. There is so much to know about the care for the many of varieties we have today that I thought it would become boring and confusing. The rose I feel I should talk about are fairly new to the garden, they are a repeat bloomer that bloom from May to December and in the south all year. The series are called ” Knockouts” and if pruned and fed right will surely live up to their name. Many modern rose cultivars are known by their trademark names rather than by their registered cultivar name so the series Knockout may not always be found in reference books by this name. 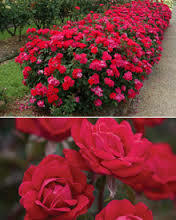 But with the Internet today just search for them as Knockout roses and read all about these wonderful new cultivars. I have been growing and pruning these beauties for years and want to share what I have found to get peak performance from them. This rose does best in full sun but I have been able to keep them in bloom in semi shade, but the bloom is not so perfuse, they are drought tolerant an make good planter plants and do well with other annuals, perennials and amongst ornamental shrubs. I start in the early spring, end of March first of April, I feed with a good rose fertilizer but most often I use a balance fertilizer 10-10-10 to get them off to a roaring start, I also prune at this time to start the final height for the season’s end, so I cut away 3/4 of the previous seasons growth to the dormant bud location, which will produce a new flower bud lead. When this bloom fades cut that bloom stem back to the fifth leaf down just above the dormant bud and do this at various height throughout the plant, so that the growth lengths are staggered and thus gives the plants new growth a natural look, with a longer stem growth for cutting, as they do well as cut flowers if cut just as color shows on the buds. The second pruning is needed to produce maximum bloom and a small amount of food to keep strong and steady growth and at this time some diseases control might be applied, although they are sold as disease resistant, our very humid summers are a challenge for them. The third pruning is like the second, as the bloom fades prune back a little further and feed, this should happen in August first of September and this is the bud set that will take you well into the late fall and early winter. It is this time that you may decide whether to dead head or to leave the hips for winter interest and color, I will feed with a 5-10-10 to help the stem and late bloom and roots for the cool days ahead. By this late season haven started with the 3/4 cut in the spring, the rose will be at the best height of 4 feet, perfect to cut and to lightly lean into smell. These roses for me remain in heavy bloom from May to December and for many years I have cut them for the Christmas table. With all the years of trying to grow roses, the Knockout Roses are a show stopper and every garden that I play to work in I always hear people say how do they get these roses so full of bloom all season? So now you know a little secret from a gardener how over the years has spent a lot of time in the garden. Roses have played a role over the centuries throughout the human race and cultures, they’ve been used to cure us, to help us to communicate in times of great emotions and as a symbol of victory and nobility. But of all things the rose teaches that some time with beauty there can be thorns and it is best to respect that, with life its self, create beauty from within and the thorns will strengthen you. with the rose I shell heal. You must agree October is the month of change as this is when we received our first frost. The garden looks different now with the long shadows made by the sun’s height in the horizon and the cool evening. The time spent in the garden is shorter due to shorter day light, so the pace is a little faster, with all of the dead heading and cutting back of the plants, as we begin to ready the garden for its winter’s rest. The many potted plants are readied to return to their winter spots in Acorn Cottage as the last of the flowers are picked before frost and the moment of decision of who do we save and who is sacrified to the frost. I love this time of year, along with all of the visual changes the fragrance that fills the air from the herb garden as we harvest, to the fallen maple and oak leaves that gives a sweetness to the air that the soul remembers and our hearts know. The Toad Lilly’s are beautiful this year and the Monks Hood brings such color to the autumn tones that surround them and the autumn perennial mums are at their best as the autumn Crocus remind me of spring, their to die for. I plan to add bulbs to the Shire Garden later in the month, as I will try to keep this to a minimum. However I might plant bulbs in pots and winter them in a leaf pile and in the spring put them in the spots I need extra color, this will allow me to remove them when they pass, so that I might plant annuals with no bulbs to disturb, this will give me the opportunity to change the picture from year to year. I am looking forward to a slower pace in the garden and the beauty that comes with a morning sun lit frost that covers everything with ice crystals, which is a gift to behold. With the first frost comes a feeling of lose and yet a new sense of change comes to view and with all of this, hope is what moves us forward. A thought; Things often change and we know it has too. Embrace change! I’m not talking about a fire in the garden, but how the colors now look like the garden is all aglow like a fire. With late September here and cooler nights the reds and orange look shockingly bright with the sun light on them and as dusk arrives the yellows glow like flames. The Shire is still in full bloom and many of the ferns have started to turn lime green to gold and all of this with the last of summers bloom happening, well, all I can say is WOW! Fall has to be one of my favorite times, the crickets sing all day. The fragrance of the garden fills the air with a sweetness that only autumn knows and somewhere deep in side we remember something that we have no words for, but there is a comfort of just knowing. The pumpkins are picked and but in their places to be carved and lit with candles when the time comes and we begin to take cuttings to root for next years garden and the work begins on cutting back old growth and putting ripened seeds in envelopes. As evening comes with the cooler air and the days grow shorter we will light some of the garden torches and the fire pit will be lit where we will sit and enjoy the glow it brings at dusk to the garden, we will enjoy some warm cider and listen to the crickets song as the fire slowly goes out. What a wonderful time to be in the garden with people you love. This September’s fire in the Shire Garden has given us a new thought, like fire, the flames cleanses the earth, giving room for new growth. We will begin to burn away some of our old ways and welcome the new ways that only the flame can destroy, thus always welcoming another way. A thought; Let the flames in life inspire you to know your way. 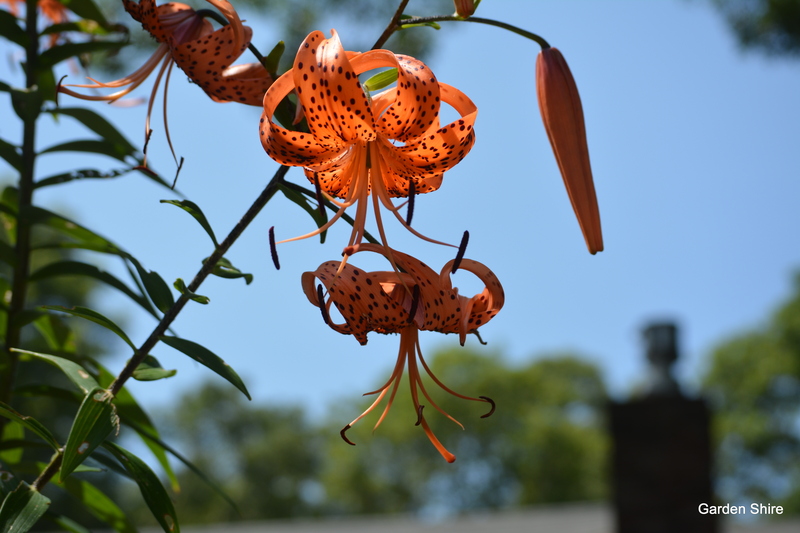 Many plants and flowers are called lilies because of their flower shape or foliage and are not lilies at all so for that reason the whole group of these including the true Lilium family fall under the larger family known as Lilaceae. OK, where is this going? 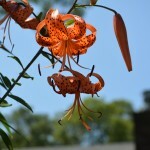 Well I thought I’d talk about lilies and then realized how I could confuse so many that I just had to make clear that I will be talking about Hemerocallis – Day lily and of the true Lilium – bulb oriental lily. These two plant groups are some of the oldest flowers in the world and are still found where old gardens once flourished, but have long disappeared. But there in the middle of no where is a stand of these lilies as a shadow of what was. So to think of a garden of today without any of them would just be wrong. They have proven the test of time and with the new varieties and reblooming hybrids its time to take another look at them. What was once thought of as boring, old, and over planted in gramma’s garden, is now revised and offer many new colors and sizes. 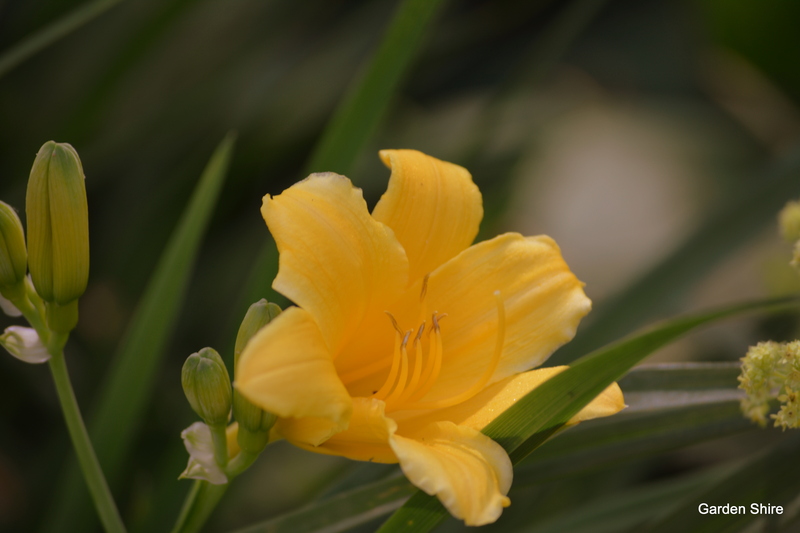 Hemercallis – Day Lily has become one of my old but new-found interests for the garden. 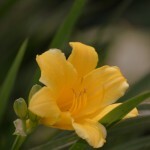 A friend of mine has a garden full of about 150 varieties and colors and she has turned me on to Day Lilies. She has correct me more than once on my denouncing them as road side trash lilies. I was only referring to the orange day lily we see every where along our road sides, I do apology now because they do bring interest to those area when in bloom. Hemercallis is Greek meaning, beautiful for one day. they are pretty care free and need no protection of any kind, even from the severest winters. Their clumps can often be left for 5 to 6 years before needing any division. Always remember that their blooms follow the sun throughout the day, and if you plant them on the wrong side of the garden or path their flowers will always have their backs to you. Their culture needs are few as they grow in most soil conditions, most will do best in rich humus well draining soils. Most will tolerate dry conditions for a short period, but prefer moist conditions. Here in the Shire Garden they are found in the Four Seasons Border Garden in drifts as well in the Angel Garden as a symbol of their heralding. They are in the element of water thus if planted within the astral signs of Scorpio, Cancer, Pisces all will do famously well. I plant mine in the new moon of June and divide and transplant on the full moon of late October and the first of November and have had great success with this. They seem to blossom fuller and for a longer period of time. This will help when it comes to picking the verity you might want. The most fragrant of this group are the Eulirion and Archelirion . Always plant them in groups of 5 to 8 and some staking will be needed. They also are of the water element sign and I plant mine in May or October. One other note, the red lily beetle and or Asiatic lily beetle has no none predator here, so every year they have to be controlled by an early, just as the lily plant emerge from the soil, systemic insecticide that will protect the plant throughout the growing season from these beetles that will kill the plant in one to two growing seasons. When I see lilies, I am reminded of by gone summers and of old friends and gardens that are now gone, of holidays and late summer picnics. They let me know of summers wane, but most of all they remind me to stand tall, that presence is everything. A thought; Lilies can transform a sad and weary feeling into JOY!